Reviewing news articles this week, I came across an article in Upside Down World calling for protests to close the US-sponsored International Law Enforcement Academy (ILEA) in El Salvador. The article, written by J.L. Heyward of CISPES, is an unfortunate collection of unsupported allegations, irrelevant connections, and logical fallacies. The project is a US attempt to continue militarizing Latin American police and to essentially "export" the US's criminal justice system to Latin America from a base in El Salvador. It can also be thought of as a last ditch attempt of the US government to maintain dominance in the Latin American region, as socialist movement and electoral revolution is on the rise. Law enforcement officials held a two day conference in San Salvador to discuss methods for combating transnational gangs. An article describing the conference from WorldNetDaily does not really identify any new strategies or plans that the assembled officials have devised to deal with the problem. Members of Hispanic gangs such as MS-13 and the 18th Street Gang are mobile, both within the United States and back to their home countries. "With the Internet and cell phones, the Hispanic gangs are now international gangs," he continued. "Gangs operate from prison and deportation simply returns the gang member back home, where gang membership just continues." Several conference attendees mentioned that Hispanic gang members use MySpace.com to post personal information and brag about their exploits. The University of Wisconsin is trying to decide what to do about the fact that sportswear with its logo was produced by an Adidas contractor in El Salvador which exploited its workers. And after that maquila factory owner absconded with funds owed to workers and shut his factory, the workers in a trade union have been blacklisted from finding other employment at other Adidas contractors. The maquila factory where the workers had been employed was Hermosa Manufacturing in Apopa, El Salvador. Hermosa was a contractor for Adidas and other brands. The violations of workers rights which occurred at the factory have been the focus of anti-sweatshop activists for several years. Now activists are pressuring universities like Wisconsin to cut their licensing deals with Adidas for the actions of Adidas' contractor. There isn't anything you can't find on the Internet it often seems. If you want to see jingles from Salvadoran TV channels, as well as the 1975 Miss Universe pageant in El Salvador, or a Salvadoran telethon, the blog Television, Advertising and Videos of El Salvador is for you. Debates about immigration reform in the US must always keep in mind that migrants are real people with families and hopes and dreams. One such life story is told by Debbie in The Story of Me I Didn't Know. Throughout the 1960's and the first half of the 1970's, the muse of revolutionary movements in El Salvador was poet Roque Dalton. 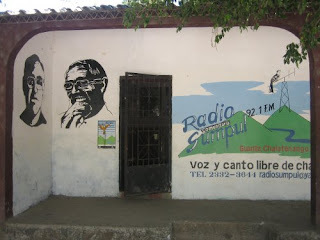 Using the pen, while also committed to armed struggle, Dalton captured the spirit of a generation of intellectuals committed to the overthrow of the oligarchy in El Salvador. Inspired by the Cuban revolution in 1959, Dalton was a pre-eminent literary voice of the movement. A harsh critique of DR-CAFTA and neoliberal economic policies from a leftist viewpoint was recently presented to public radio listeners in Chicago by Salvadoran economist Raul Moreno. After studying economics in Madrid and El Salvador, Raul Moreno worked as an economist and economic consultant for the Central Bank of El Salvador as well as for numerous international organizations and foundations. Among them were CEPAL (Comision Economica para America Latina y el Caribe), Save the Children Sweden, Consumers International and the Centro de Investigación para la Paz in Madrid, Spain. In addition to serving as president of the Centre of Defense of Consumer’s Rights (CDC), he lectures at the department of economics at the University of El Salvador. His remarks, translated into English, can be heard at this link. 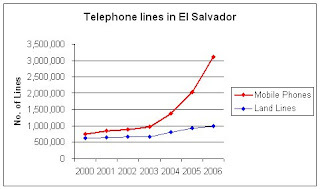 In the summer of 2006, the European Union was going to eliminate El Salvador's preferred trade status because of El Salvador's failure to approve certain conventions of the International Labor Organization. It was pressure from Grupo Calvo, a Spanish company which processes tuna in El Salvador, which got El Salvador to ratify the worker protection measures and avoid loss of those trade benefits. Gilberto García, vice president of the Centre for Labour Studies and Support (CEAL), said Calvo's campaign for better labour laws was motivated "more by commercial considerations than concern for working conditions." The Spanish company's actions belie its words, he told IPS. Meanwhile Diario CoLatinoreports that FMLN party coordinator Medardo Gonzalez confirmed that Mauricio Funes is one of the persons with a "strong possibility" of being the FMLN's presidential candidate in 2009. The other name mentioned by Gonzalez as having a strong possibility was Salvador Sánchez Cerén, secretary general of the FMLN, and deputy in the National Assembly elected from San Salvador. Gonzalez stated that the party would know the identity of its presidential candidate by the end of 2007. I have previously mentioned the plans to locate an ethanol plant in El Salvador, as part of a joint project with Brazil and the US. Although the plant planned for El Salvador will process sugar cane, US ethanol plans focus on the use of corn. This demand for corn for fuel is driving up the price of basic foodstuffs for the poor throughout the world, according to the International Monetary Fund. SAN SALVADOR, El Salvador (AP) - Unusually high Pacific waves battered beaches from El Salvador to Mexico and carried people out to sea, prompting authorities in some places to order swimmers out of the water Tuesday. At least two people were killed. Waves topping three metres swept away a dozen swimmers near La Libertad on Monday, 10 of whom were plucked from the water by boats and a helicopter, Green Cross emergency worker Jose Larin said. A 35-year-old man and a 16-year-old boy were killed. El Salvador's government advised people "to avoid swimming at our beaches due to the risk," Interior Minister Miguel Bolanos told a news conference Tuesday. 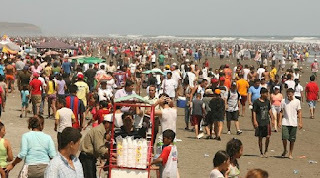 The beaches of El Salvador are full with vacationers as this picture from La Prensa shows. See all of the beach action at this La Prensa photo gallery. Ms. Berghaus, a 26-year-old from the Boston suburbs, walked into a humble homestead here in rural El Salvador on Tuesday and spotted someone a generation older with a face that resembled her own but whom she did not know. Then, mother and daughter embraced. Soon after, others came for hugs of their own. Confronted with siblings, cousins, nieces and nephews — strangers all — Ms. Berghaus wiped tears from her cheeks. “Hola,” she said, one of the few Spanish words she knows. Palm Sunday in Panchimalco. Photo Gallery.Procession of "Jesús en la sombra." Photo galleryThe Way of the Cross in San Salvador Photo Gallery.Procession of the Resurrected Christ in San Salvador Photo Gallery.La Prensa's Semana Santa section is here. El Diario de Hoy is here. Many voices [are] calling for the repeal of a 1993 amnesty law seen by activists and United Nations experts as the biggest hurdle to achieving respect for human rights, as the country's homicide rate soars and forced disappearances are occurring once again. Salvadoran Human Rights Ombudswoman Beatrice de Carrillo reported a further rise in the murder rate -- already one of the highest in the world -- and a resurgence of forced disappearances in recent months.